We aim at improving ourselves, but more than that of the society at large, by hard work, dedication and guidance from our experienced and supportive faculty. We at Vanaj feel that our partner is just like a family member and also the best stakeholder. We want to establish long term relationship with immense care. We thrive to work towards student’s awareness and also to give the perkiest opportunity to our sponsors by giving them significant advantage via allowing them to broadcast their brand and to attract crowd of University of Delhi and other Universities in our college. 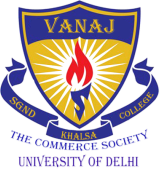 It was formed by extraordinary contribution by our Principal Dr. Manmohan Kaur, Dr.Vinod Kumar, Mr. Simranjeet Singh, Mr G.K Arora and all the respective teachers of commerce department with plans to form this prestigious society of our college and to organise the first ever inter college fest, getting our institution at par with other renowned colleges of Delhi university and other renowned Universities.